Le salon est équipé d'un canapé en cuir fin, cuisinière designer, Bose station d'accueil iPod et télévision à écran plat. Tous les nouveaux et modernes. Salle à manger est équipé d'Arne Jakobsen Elipse table et '7 'chaises. Tous les design danois et la qualité. Vielen Dank für die netten Worte und die Empfehlung. Es freut uns, dass Ihnen unser Chalet gefallen hat und es würde uns freuen, Sie wieder in Arc en Ciel willkommen heiten zu dürfen. Beautiful, well-designed chalet, spectacular view. We loved our stay at the chalet. Our family came for a long weekend to enjoy some summer hiking and stargazing. The view from the chalet is spectacular and the surroundings so peaceful and relaxing. At times, we found it hard to leave the loungers on the deck and wanted to just sit and enjoy. The chalet is very well designed with many places to gather and socialize and an equal number of places to find a bit of personal space if needed. The beds were very comfortable with fluffy duvets and down pillows (we took note of the brand so we can buy them for our new flat!). The kitchen was well equipped and we prepared almost all of our meals at the house, although there are a number of nice, small cafes in the towns below. The owner also suggested hikes and walks to different restaurants as well. While we were there in the summer, the house would be amazing in winter too as its ski-in, ski-out location would be perfect for avid skiers as well as for anyone who would rather stay and hang out and relax. I think my daughter said it best..."Coming up the stairs to that view just never gets old. It takes your breath away every time." Yes, it does. Thank you so much for letting us stay at the chalet. We hope to return in for a winter stay! Will be more than happy to welcome you back to Arc en Ciel - summer and winter !!! Einen wunderbarer Urlaub in einem schönen Chalet in traumhafter Lage. Die Ausstattung ist perfekt. Es fehlt an nichts. In der Nachsaison im Skigebiet Les Collons ist es sehr ruhig und erholsam. Den Frühling in den Schweizer Alpen zu erleben, war ein sehr schönes Erlebnis. Das Chalet empfehlen wir gern weiter. Wir haben uns sehr wohlgefühlt. Vielen lieben Dank für die sehr positive Bewertung. Es freut uns, dass Ihnen das Chalet und auch die Gegend gefallen haben. Wir haben uns bemüht, das Chalet liebevoll auszustatten und auch dafür Sorge zu tragen, dass nichts fehlt - auch wenn man Kochen mag. Es würde uns freuen, Sie wieder in Arc en Ciel willkommen heißen zu dürfen. We stayed in the chalet from 5 March to 12 March and had the most amazing holiday. The host family had thought of everything and we were provided with an introductionary guide to the chalet and the area prior to our visit. Very thoughtful and extremely useful. The chalet appears to be almost brand new and was in mint condition. The view from the panoramic windows and the outdoor terrace was breathtaking and we enjoyed staying in the chalet just as much as skiing on the slopes. 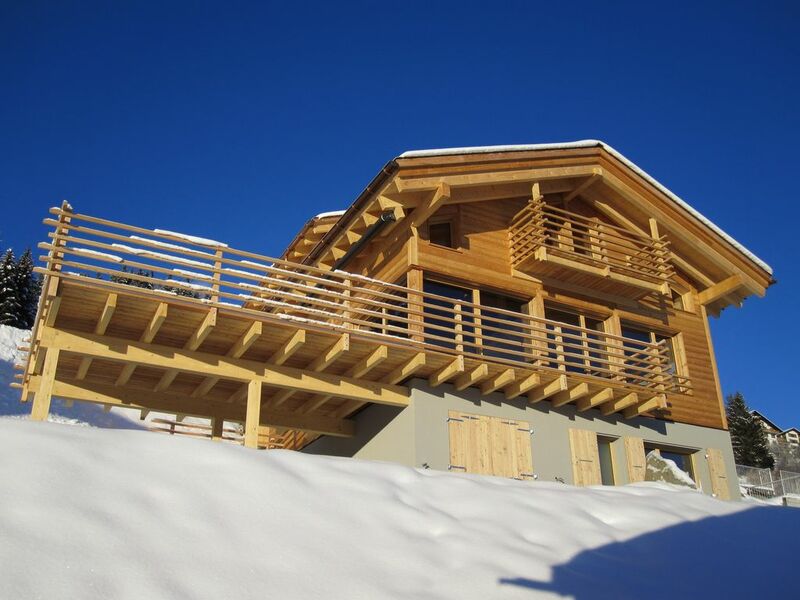 The fact that the chalet offers ski-in/ski-out was extremely convenient and something that definitely added to our overall delight with renting the chalet. This is definitely not our last visit! Thank you for this very positive review. We are happy to hear that you have enjoyed your holiday in Arc en Ciel and that the information we send ahead is actually useful. It is of greatest importance to us that our guests feel comfortable and can enjoy and relax while staying in the chalet. We would be more than happy to welcome you and your family back in Arc en Ciel as the biggest recognition you can have is your guests returning for another vacation. 2010 pavillon de luxe avec vue sur la montagne, Vue sur le Cervin - un ski-in ski out chalet. Architecte-dessus de meubles et d'accessoires standard, un service raffiné, Bose Sound Dock, chauffage par le sol, etc et de haute qualité des lits confortables. Une des plus grandes stations de ski en Suisse, 420 km de pistes, du vert au noir. Un des meilleurs Arenas hors-piste. Garage et 2 places de parking. Une heure en voiture de Montreux Riviera et de la plage. En été, idéal pour la randonnée, le trekking et le VTT. Tennis et golf à proximité. Vue sur le Cervin du chalet et de nombreuses attractions à proximité. Ski: Ski en - Chalet de ski! La station de ski Les Collons est dans le sud de Quatre Vallées Verbier vers le nord. Tous les niveaux de difficulté sont disponibles - à partir de noir vert. Et une école de ski très bonne, Les Collons Thyon. «Le ski au plus haut niveau» avec 410 km de pistes et de nombreuses pistes fantastiques neige profonde. Nouveau télésiège Express Etherolla. 'Central Park' Park Snow Big à Thyon. Attractive train transport entre Thyon et Les Collons. Patinoire à Hérémence. Un sentier de pistes rouges devant le chalet à Les Masses télésiège, qui est une partie de la station ci-dessus. Si vous vous promenez le soir, avec l'utilisation que les pistes rouges. bottes à sec disponible dans le chalet! 10% pour la location de ski à Sports Theytaz Les Collons 1800 si vous habitez dans Chalet Arc-en-Ciel. L'un des plus grands domaines skiables en Suisse. 420 km de pistes de Les Collons à Verbier. lien vers la carte des pistes ci-dessous: http://ski. intermaps. ch / Printze / index.